Summary : This won't be my favorite tea in the cupboard, but it's not a bad tea either. Sort of tasted like the Orange Spiced Flavored Black Tea that is available through Culinary Teas. Review : Confession time. This was the very first oolong tea that I ever tried. I bring this to light simply because I have nothing to compare this tea too - at least in relation to other oolong teas. This will soon change, since I recently ordered over 20 oolong teas from other places. But until those teas arrive, and I get around to tasting them, I'll have to compare this particular tea to other non-oolong teas. OK. Now that the disclaimer is out of the way, let's move on and review this tea. Here is the description of this tea as provided by Culinary Teas : "A wild and exotic fruity tea made from a combination of premium Oolong and Ceylon teas, orange essence, and a light jasmine blossom scent." For anyone who has read my other reviews on Tea Discussion, you should know by now that I postively adore and love oranges. If a tea says "orange" somewhere in the title of the tea or in its ingredients, I will almost certainly try it. And so it came to pass that I found myself with a Oolong Orange Blossom tea from Culinary Teas . Having never tried an oolong tea before, I really had no idea what to expect. Would it be sweet? Would it be like black tea? Or something inbetween? Well, to my tongue at least, this particular oolong tea tasted remarkably similar to an Orange Spiced Flavored Black Tea. Which means the tea was ok, but nothing horribly special to me. Really, this tea just tasted remarkably like a black tea. I have to admit, this surprised me, as oolong tea leaves are processed differently than black teas are. So what about the orange taste? Hmm....good question. Now, maybe the orange in the title referred to the very pretty orange color this tea takes on when brewed. However, in terms of taste, I could find no hint whatsoever of orange in it - which of course disappointed me! All in all, my first oolong tea tasting experience wasn't the happiest experience of my life, nor was it the worse. It was, however, since I had hoped for a orange taste in this tea - disappointing! Recommendation : Maybe. If you like traditional black teas, you'll likely enjoy this one. 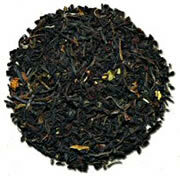 And if you like "Orange Spiced Flavored Black Teas", you'll definitely like this tea as the flavor is almost identical. However, if searching for an "orange taste", check out other Orange Teas on this site, as you won't find any orange taste here. And in case you are wondering, adding milk to this tea did nothing but turn the tea a rather unpleasant looking orange. Brewing Instructions : Pour 6-7 ounces of water heated just to below boiling point over tea leaves. Let steep for 4 minutes. You'll want to use 1.5 teaspoons of leaves for each cup of tea due to large and awkward size of leaves. Culinary Teas Oolong Orange Blossom Tea : A very pretty oolong tea that tasted nothing like oranges.